UPal Give Away Contest is BACK ! 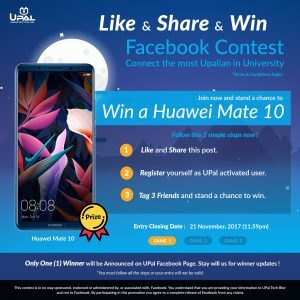 This time, you stand a chance to win a brand new Huawei Mate 10 worth RM 2,699 !! Step 3 : Tag 3 friends and stand a chance to win! This contest is open to all Malaysian Residents, aged 18 and above. The contest period is from 1 – 21 November 2017. Submission closes at 11.59pm. Only one (1) Winner will be selected by UPal and will be notified on Facebook. Winner will be announced within 7 days after the contest ends. The winner must respond to our contest announcement and provide details within 3 days. Failure to do so will result in a prize forfeit. Winner will receive their prize within 30 days after the announcement is made. UPal reserves the right to amend or cancel this contest at any time.